Hello Folks! 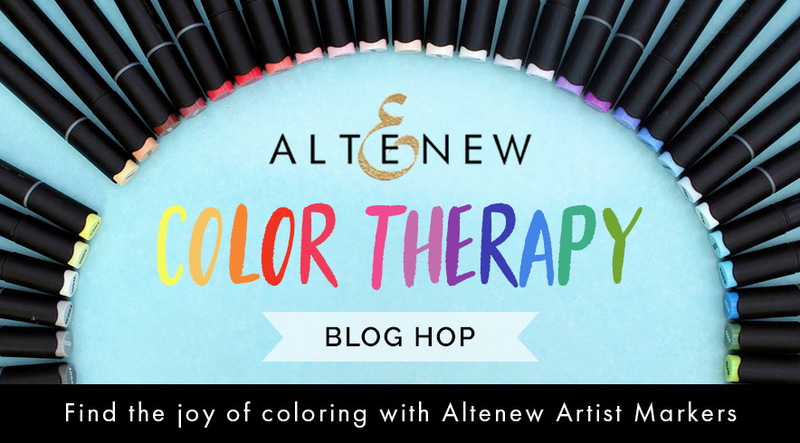 I am super pleased to be participating in the Altenew Color Therapy Blog Hop, which is hoping to encourage people to head to their crafty space and just color something! 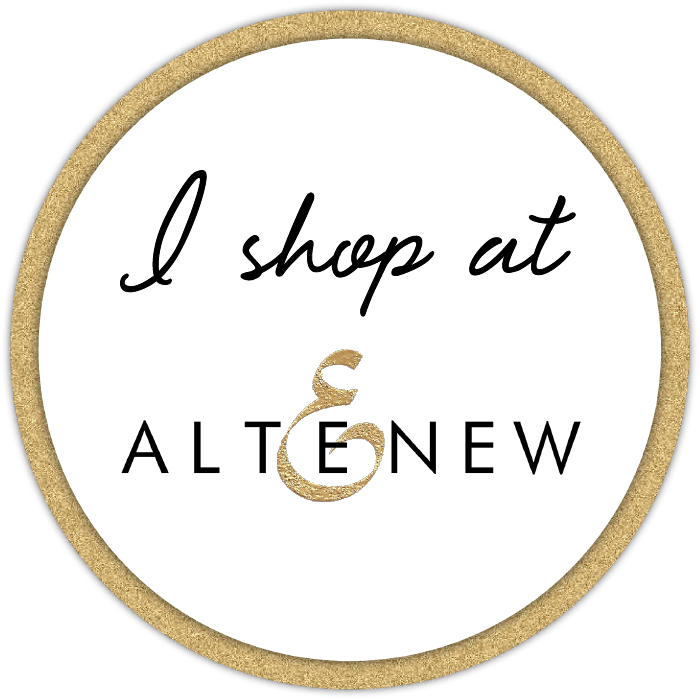 You may have come from Agnieszka Malyszek's blog (big time fan girl here), but if not feel free to start at the beginning with the Altenew Card Blog. We all know that Altenew is famous for its amazing floral stamps, and I'm guessing that you've already been treated to a lot of beautifully colored florals on this hop. 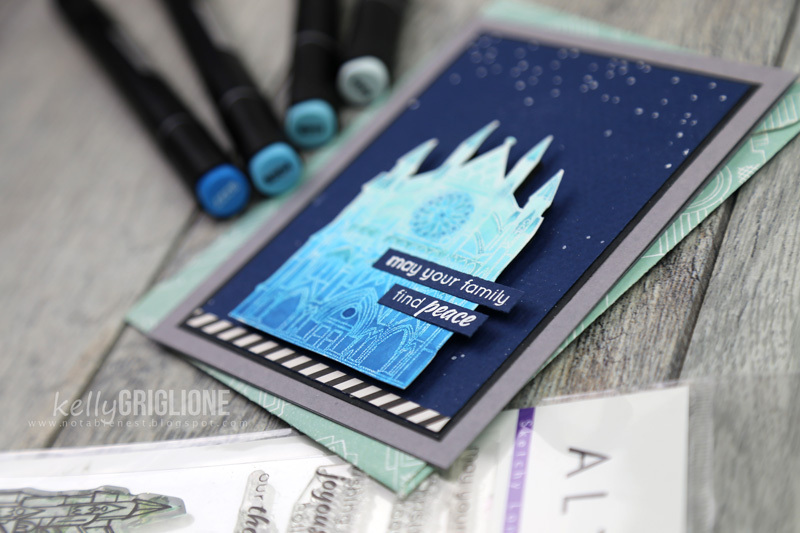 So in order to mix things up a bit, and because everyone on this hop is a pro at coloring florals, I decided to pull out one of my favorite non-floral Altenew stamps ... the cathedral from Sketchy Landmarks. Sympathy cards are often the hardest for me to make. I stayed within a somber blue palette to make this appropriate for a sympathy card. I was going for a cathedral at dusk vibe, with several stars twinkling high in the night sky. 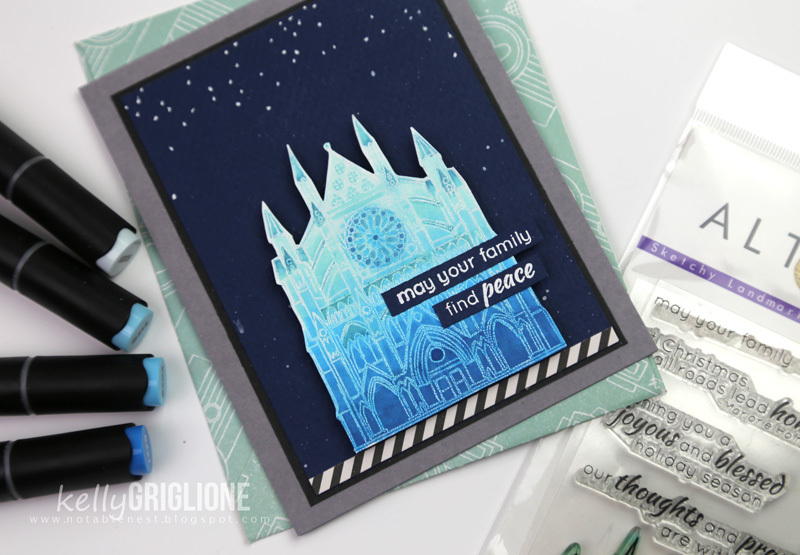 I embossed the cathedral in white and then went about coloring it in with the set of blue markers from the Altenew Artist Markers Set A. I was so excited to try the artist markers, and I have to say I really love them! The actual marker shape is somewhat triangular, which makes it fun to hold. And the blending is just like blending with Copics. After blending in the overall color for the cathedral, I went in and added some details to different parts of the cathedral, like the roofs, stained glass, peaks, and windows. 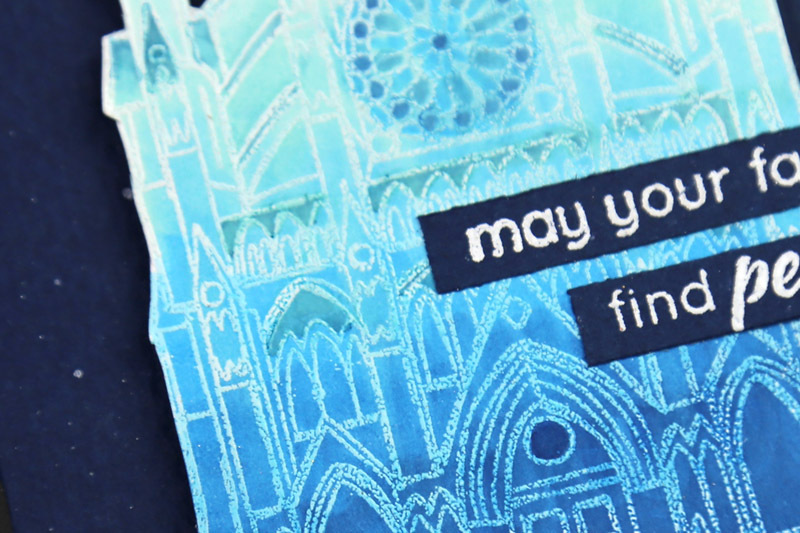 I elected to mount the cathedral with some foam tape to have it stand out against the sky and so the sentiment strips can hang off the edges a little. I have to admit, when I sat down to complete this project, I was a little unsure of how to color this image since it had so many little sections. I actually started out coloring each section a different color, but quickly gave up because it wasn't looking all that good, and because it would take forever to complete. Coloring the image as a whole and adding a few details, however, was much more manageable, and in my case turned out much more attractive. If you are thinking about trying some of the Altenew Artist Markers for yourself, they are all 15% off with the code HAPPYCOLORS at checkout. I'd recommend the Set A since it has a complete set (4 different shades) of red, blue and green. Or, you can just get a set of 4 in a single color to try them out. The coupon is valid 7/12/2018 at 12:01 AM EDT through 7/15/2018 at 11:59 PM EDT. Shop HERE>>https://altenew.com/collections/markers Not valid on previous purchases. Cannot be combined with other promo codes. The generous folks at Altenew are also offering a $20 gift certificate to one lucky winner who comments on this post! I will announce the winner on 7/18/2018. How awesome is that? 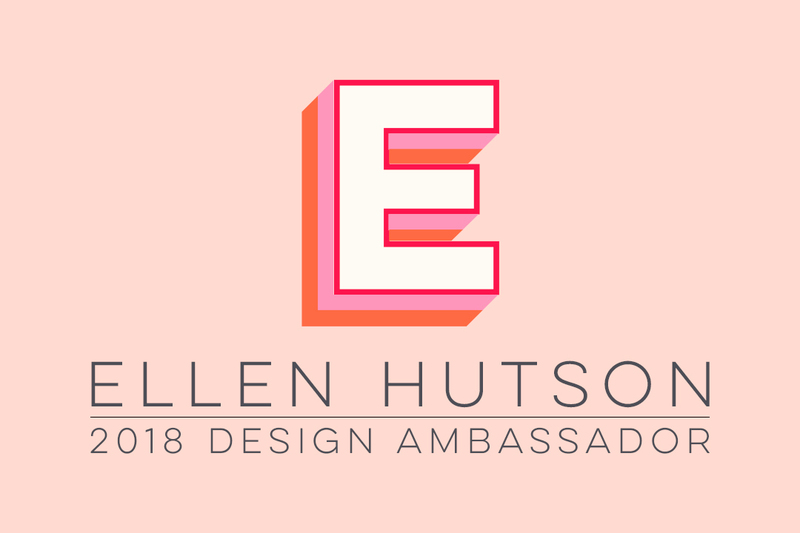 Your next stop on this hop is one of my fellow Ellen Hutson teammates, the lovely Justine Hovey. Really stunning! And not just because blue is my favourite colour, it's so elegant and striking. You're right, sympathy cards are not easy to do, but you have made something pretty yet tastefully done. Nice! Love the gradient effect with the blue!! BEAUTIFULLY done, Kelly! 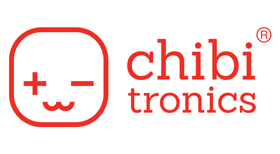 So glad to have you in this blog hop! Hope your summer is going swimmingly well! Hugs! ( yesterday I listened to the song from Green Day that will top the UK chart this week!!Haha!). we see so many beautiful florals! It's gorgeous. Your card is beautiful ! Thank you for the inspiration, I'm like you, I always have problems to create sympathy cards, so I'm very happy to find great ideas like yours. JUST WOW! It's glowing! I love it! Beautifully done Kelly! Sympathy cards are never easy, but this is sure to bring comfort to the recipient! What a lovely and sweet sympathy card, great job. I really love how you colored this GORGEOUS Cathedral!! The blending of colors is just sooo AMAZING!! Your colouring turned out amazing! Very pretty card! LOVE the blending! This is so pretty! Love these new products and the hop as well for they inspire me to color--thank you! Very elegant card. I love the color blue you used. I really like how this turned out. Love blues. Beautiful. Love your coloring of the church. I love the white embossing of the church. Your background is stunning and the sentiment so thoughtful. Gorgeous card! So beautiful! Looks very elegant. And it is good break from the floral images. Very nicely done, sedate and elegant - perfect for a sympathy card. I was not expecting this after all of the flowers. Beautiful card and perfect for a sympathy card. Love how you 'ended up' colouring the Cathedral, its really beautiful and has great contrast against the background. Thanks for the clever idea, Kelly!!! Am loving the ethereal look! It almost looks ombre! Gorgeous in the blues from Set A and am so loving this blog hop but keep running off to shop!! LOL!! Good choice on using the cathedral! Love the picturesque night sky! 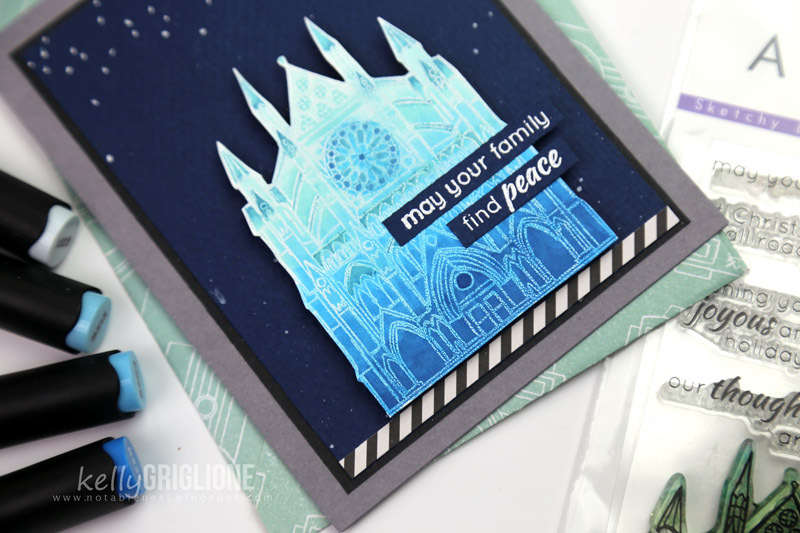 Your choice of cardstock colors work wonderfully together as well! ~ L.W. I love your night scene! The colors you used for the sketchy landmark is just perfect for the background! Thanks for the inspiration! Love the blue cathedral with the blue background. Great job! Beautiful card. Love how you colored up the cathedral. I could see this as a holiday card as well! This is so beautiful! The colors and your creativity are so inspiring! Awesome job coloring the cathedral! It has a beautiful ombre effect and the perfect amount of highlights. It looks as if it was lit from within. Lovely card! Such a striking card - love the use of the dark blue and the embossed sentiment!! Such a clever idea. Monochromatic is beautifully done using these markers. Oh my - so wonderful! This is dreamy! Thanks for sharing such a great technique with these new markers! Beautiful card and as you say, sympathy card are not the easiest but this is lovely.. Fantastic card! So very peaceful. Lovely coloring. Beautiful sympathy card and lovely coloring. Love the blue tones. Beautiful card, I love the blue colors! Beautiful blues on the cathedral, this is just stunning! Gorguos card, I love the contrast between the image and the background, and the colors that you chose. Thank you so much for sharing. Nice use of the monotone coloring. LOVE this card, the navy blue and teal color are so pretty together!!! Beautiful cathedral and perfect for a sympathy card. This is fantastic!! Coloring on the whole this way is really awesome!! Oh I love this! The gradient coloring is perfect on here! Gorgeous coloring, love your night sky too. Kelly this card is perfect. I struggle with sympathy cards a lot, this is a great design, thanks for the inspiration!